It doesn’t seem to matter where someone goes, the desire to have constant access to the Internet is one that never ceases. So much so that hotels, coffee shops, restaurants and even doctor’s offices provide free Wi-Fi connectivity. It stands to reason, then, that churches are increasingly reaching the decision to offer free Wi-Fi throughout their campuses. Some congregants use the network to look up Bible passages or research various aspects of the teachings, while others simply desire the ability to check their emails on a constant basis. As with anything related to technology, there are certain security risks that may pose an issue, but there are also a number of benefits to offering free Wi-Fi at the church. With the proper security measures put in place, providing free access to Wi-Fi at church is generally more of a benefit than a risk. Free Wi-Fi provides members the ability to find related passages of scripture with a Bible app or take notes on the sermon or various items through the use of note-taking apps on their devices. They also have the unique ability to easily review any materials related to the sermon offered by the church. Most churches now make it a priority to maintain a strong social media presence, and members of the congregation often participate in that presence by live tweeting the message as well as sharing images and videos throughout the course of the service. Free Wi-Fi offers congregants a feeling of openness and acceptance by the church. A large part of social media involves location tracking, which enables users to perform “check-ins” at the church’s location. This lets others know that they are currently within the congregation and offers a non-verbal invitation to their personal followers to join them for the service. Having improper security in place poses the risk that anyone connected to the free Wi-Fi network could potentially gain access to sensitive church information such as bank account numbers and financial data. Security is necessary to protect against the risk that anyone uses the network to illegally download pirated media content. Free Wi-Fi, without security measures in place, opens the network for use in downloading or streaming content that is inappropriate. 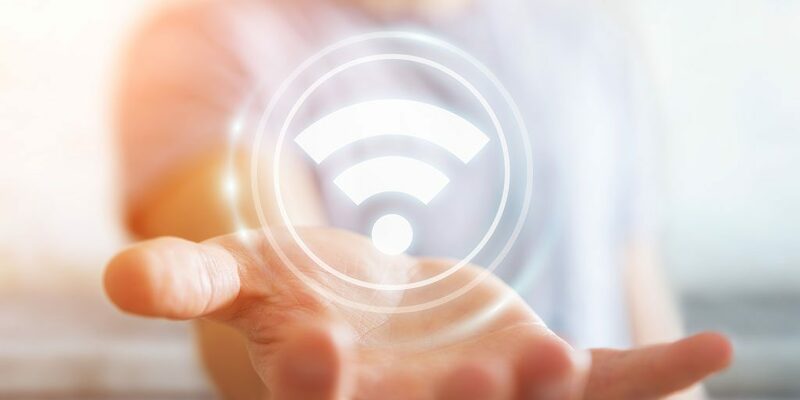 The heavy use by additional people connected to the Wi-Fi network has the potential of slowing the network and disrupting various aspects of the church’s normal operation. Offering free Wi-Fi to non-staff users at the church becomes far safer by creating a separate network for guests. Another layer of security is also created by password protecting administrative computers and having a set period of time for changing passwords, as well as use of a strong password. In order to supplement security, change the password regularly on the guest network. This serves as a method of ensuring that only attendees have access to the network as well as safeguarding against the risk that someone not in attendance has access to the network for use in ways that the church would not condone. Wi-Fi security strengthens when users must agree to the church’s terms of service before being given access to the guest network. Internet usage policies are effective in dissuading users from the use of the network for anything considered illegal. Installation of content blockers and content filters effectively block inappropriate content or websites from being accessed on the church network. At Beacon Insurance Agency, our primary function and foremost mission is providing the insurance needs of churches, Christian schools and nonprofit organizations throughout the Gulf Coast. Safety and liability risks are a regular concern for churches offering free Wi-Fi, so we encourage our clients to take advantage of our partnership with GuideOne Insurance and the exclusive access it provides to use safety resources that offer guidance in whatever risks they face. Offer your congregants free Wi-Fi that enriches your ministry! Call Beacon Insurance Agency to learn more about the insurance coverage and many safety resources we offer today!